More Info: A 30 year old sports betting professional from Ottawa, Ontario, Canada. After graduating with a business degree from the University of Ottawa I decided to get into the sports betting industry full time. I run the site here at Sports Betting Canadian and write the majority of the content. All of the pages here on the site will have been written by me and I do all the writing for the hockey, soccer, tennis and UFC picks articles. The second of two massive boxing matches this year (GGG vs Canelo 2 being the other) is taking place this Saturday, December 1st at Staples Center in Los Angeles. Two …. It was another rough week for my NFL picks in week 12. I went 0-2 after the Bengals got absolutely destroyed by the Browns, and the Packers came up a …. I took two underdogs this past week. Both teams lost by under a touchdown and more than a field goal, but only one beat the spread for a 1-1 week. …. And then there were two. The Redblacks and Stampeders both advantage of their home field + bye week advantage and booked their spots in the 2018 Grey Cup. I took …. The Divisional Finals are in the books and the 2018 Grey Cup is set for next Sunday at Commonwealth Field in Edmonton. Last weekend the Redblacks took control of their …. The Jaguars came through for me down the stretch, scoring the final 10 points of their game with the Colts to lose by 3 resulting in a push on my …. And then there were four. The Hamilton Ti-Cats absolutely thrashed the BC Lions this past Sunday, and the Blue Bombers were able to go into Saskatchewan and get a big …. The 2018 CFL regular season is in the books. I went 2-1 in the final week of the season to finish the regular season on a winning note and conclude …. 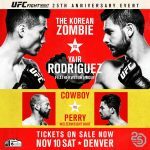 The UFC is heading to Denver this Saturday for a Fight Night card that includes four great fights. The UFC has a busy month of November with something going on …. The Lions let me down yet again last week, but the Panthers came through an easily covered the spread against the Bucs to leave me with a 1-1 week 9. ….